This is how we process the information that you provide when visiting the SAK.fi, Tradeunion.fi or Testaatyoolosi.fi website. Monitoring of SAK.fi, Tradeunion.fi and Testaatyoolosi.fi websites traffic. Visits to the www.sak.fi, the www.tradeunion.fi or www.testaatyoolosi.fi website. The website sends a cookie to the browser. This is a small text file that is saved on the storage device of the visiting computer. The cookie identifies the browser and some details of the operating system. SAK does not release information to third parties. Google analytics may release information to third parties that it uses for processing collected data, or if such releases are required by law. Google has announced that it only records non-identifying data, meaning that it does not associate collected data with any individual person. Google Analytics mainly uses first party cookies for providing a website analytics service. Information is held on a Google server in the USA. Google has revised its terms and conditions of use to comply with the General Data Protection Regulation (EU) 2016/679. SAK approved the revision of terms and conditions of use from the webmaster@sak.fi account on 17 May 2018. There are no manual materials. Google monitors physical access to its data centres in accordance with its own policies. Only authorised employees, contractors and visitors may access data centres. Data are recorded in coded format and decentralised across multiple physical and logical entities for replicability and expedient use, and to prevent tampering. The IP addresses of visitors to the SAK.fi, Tradeunion.fi or Testaatyoolosi.fi website are stored on Google servers for 50 months to enable comparative analyses of website traffic with previous years. Google has revised its terms and conditions of use to comply with the General Data Protection Regulation (EU) 2016/679. 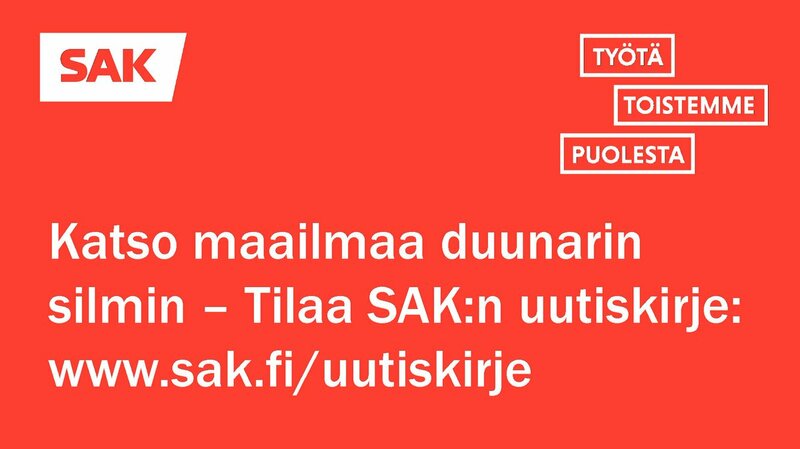 The revision of terms and conditions of use was approved from the webmaster@sak.fi account on 17 May 2018. For further details visit Google analytics: Data privacy and security. Visitors to the SAK.fi, Tradeunion.fi or Testaatyoolosi.fi website are entitled to check the information collected during a visit to the site if any individualising details are gathered during the visit. This is how we process the information that you provide using the SAK comment form.